Click the Toolbar Options button to the left of the Sign In button, on the right side of the toolbar. 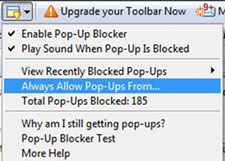 Click on the Pop-ups category. Make sure the radio button for Allow Web pop-ups from these sites: is selected, and then add your company's URL (web address) and click Add and then click Save. Go to your company's website. Click the dropdown arrow next to the pop-up blocker button and select Always allow pop-ups from [yourcompanyname.com]. When your Yahoo pop-up blocker blocks a page you are trying to view, click on the Pop-up blocker icon. You'll be prompted with a verification box. Click OK and then Close.